My pessimism was for naught. 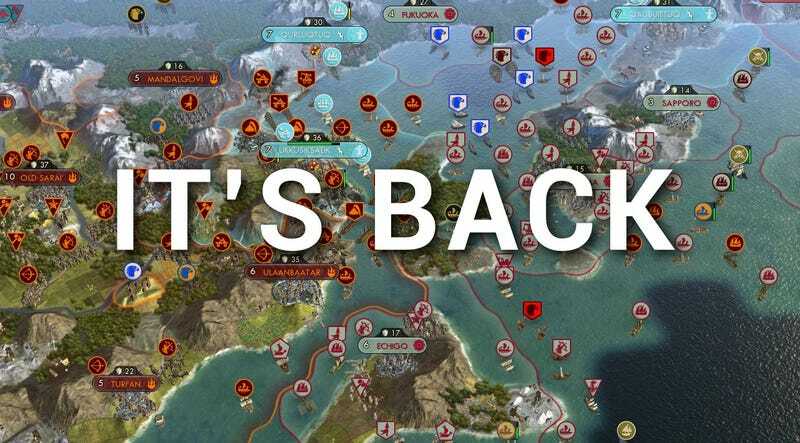 The giant 42-player, AI-only Civilization V game that had seemed doomed has in fact been saved, and the surviving Civs are free to resume soaking the dirt with the blood of their enemies. When the game broke down last week, bogged down by mods, an AI hiccup and the sheer scale of the map (it was taking over 20 minutes just to load! ), it was thought the sole chance of reviving it lay with the save game being repaired by someone at Firaxis, the guys who actually made the game. But nope! The host and organiser of the Battle Royale, TPangolin, managed to fix it himself. The glitch actually causing the halt, related to Japan trying to build too many naval units, has been solved by manually going in...and destroying Kyoto. If you're new to the Battle Royale, you can catch up here with recaps of previous day's action, in the form of galleries that contain commentary on the battles and sometimes gifs (like the one below) and maps breaking it all down on a global scale as well. UPDATE - This post originally stated it was Firaxis who repaired the game, when it was actually TPangolin himself who patched it up and got it working.